I love knitting colorwork. There's something about making little pictures appear that is so addictive - you just want to keep going until the next motif is finished! It's fun to design too - I quite enjoy the challenge of transforming a limited number of squares into something recognizable and beautiful. But, for the uninitiated, colorwork can be quite intimidating. How do I choose the right colors? Why does it make my gauge all weird and pucker-y?? What do I do with all these ends?!! Today, I'll be sharing some of my tips and tricks for success with colorwork. This isn't a be-all, end-all guide, but it should help get you started on or improving your colorwork skills. Back in the early days of my knitting journey (my 8th project on Ravelry! ), I decided to give colorwork a try. I downloaded a copy of Adrian Bizilia's Squirrel & Oak Mittens and went to my local yarn shop and picked out what I was sure was two sufficiently contrasting yarns, after all, look at how bright that purple was! If you squint really hard, you might be able to see the squirrel and oak leaf... maybe. So where did I go wrong? To get science-y about it, every color has a hue, a value, and a saturation. Hue is what we normally refer to as color: blue, red, green, etc. Value is the relative lightness or darkness of a color, or, how much white or black is added. Value takes red to a pink (white added) or to a deep crimson (black added). For a colorwork pattern to "pop" you need it to be high contrast. 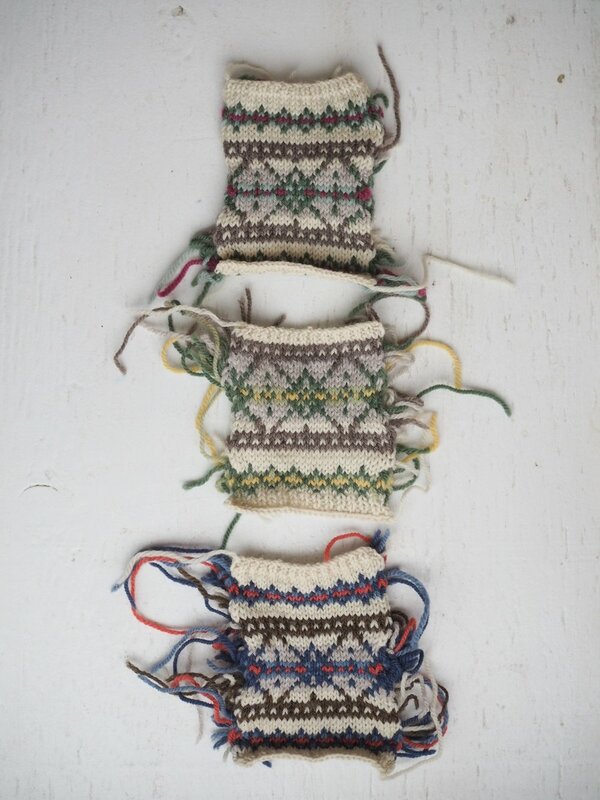 The tricky part with colorwork knitting is that while the color/hue may be noticeably different (blue versus green, or purple versus gray) if the saturation and value are close, you're going to end up with a low-contrast, muddled mess like my squirrel mittens. But value can be hard to read with the naked eye - so what do you do? There are a few things you can do (from least to most effort). Most digital cameras and/or phones with a camera will have some kind of readily-available black & white/grayscale filter. Essentially what a black and white filter does is remove the hue - leaving you with the value and saturation. 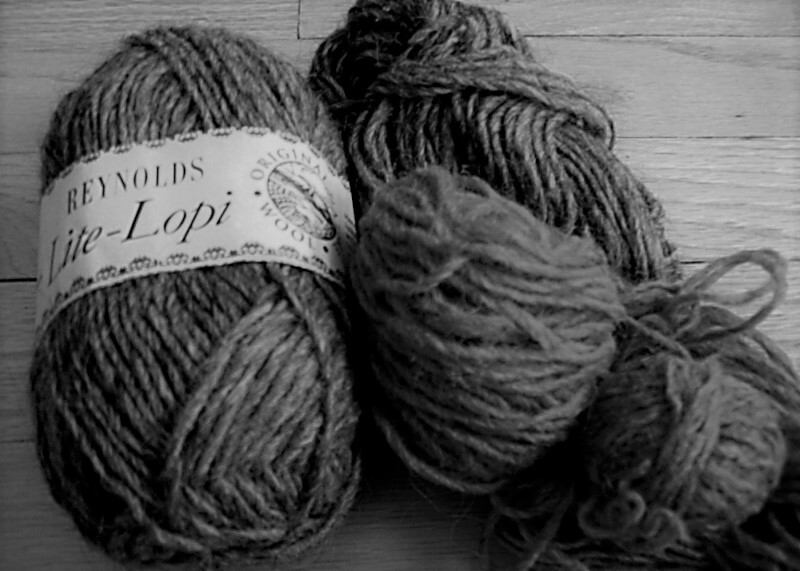 If you take my mitten example above and turn it into a grayscale image, it becomes immediately clear, even in the skein, that those colors have very similar values and saturations and therefore almost zero contrast. Here's another example. I threw together a quick colorwheel from yarn I had on hand. All of the hues are clearly different, but when you cut back to value and saturation, the red, purple and blue are almost indistinguishable. NB: This scale only applies to the yarns above, as the value and saturation of any yarn may vary despite the being similar hues. In the grayscale version, we can see four distinct values, from the light (yellow) to the light-mid (green), to the dark-mid (orange), to the darks (red, purple, and blue). For a two-color project, the further apart on the scale, the greater the contrast (with black/white being the greatest possible option). For a three-color project, you'd want a light, something with a mid-range value, and a dark. The more colors you add the more complex it becomes. Don't have a camera on hand? Sometimes squinting can help block out the hue. Part of the problem of looking at the yarn in the skein is that you're looking at a whole lot of it at once, whereas in colorwork, you're looking at a few stripes or stitches at a time. Pulling out just a few strands and laying them next to each other gives you a more realistic view of the quantity of each color. If you have access to a colorcard, they've already done the work for you - I've snipped out bits of my colorcards and rearranged and re-taped to the card countless times. If you don't have access to a colorcard, you can make your own project specific one (assuming you're using yarn you've already purchased) by wrapping yarn around an index yard folded in half. Once you've got a colorway that is working, you can use your knowledge of value and saturation to mix it up by swapping out colors with similar values/saturations. In the swatches below, 4 of the 6 colors are exactly the same. The only changes are yellow for magenta and pale green for mint green, but it makes a huge difference in the final swatch. The original one of the left has a cooler, more wintry feel, while the swatch on the right is brighter and more springy. So you've got your colors, but what about the actual knitting part? Colorwork is almost ALWAYS going to have a tighter gauge than non-colorwork stockinette knitting. And the longer the "floats" between stitches of a certain color, the more true that's going to be. It's simply the nature of the beast. Regular knit fabric has give and stretch because it is essentially a series of loops. As you pull horizontally, those loops flatten into a straight line. With colorwork, the float (or non-working yarn) is traveling in a straight line between stitches (black, in the example above), so it doesn't have the same slack to stretch with. 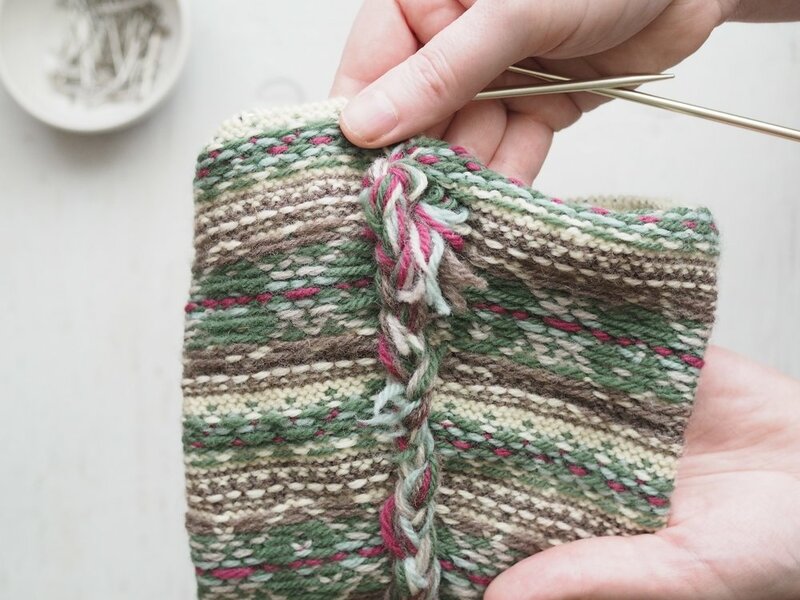 Knitting inside out is way easier than it sounds and is a great way to manage tension on smaller items like mittens, hats, and socks. It makes a bit of a difference with the body of a sweater, but not as much. When you knit right side out, the right side of the garment is facing outward and the needles are on the side of the fabric closest to you. When you knit inside out, the wrong side of the garment is facing outward and the needles are on the side of the fabric farthest from you. You're still knitting normally, you're just looking at smaller portion of the right side fabric. The reason this helps is because the outside circumference of the garment (here a sleeve) is slightly bigger than the inside, which is usually mushed up on your needles. To cover that longer distance, your floats have to be just a little bit longer, which makes all the difference. If you've only got two colors and they're used consistency throughout the project, ends shouldn't be a huge deal and you can weave them in as you normally would (trying to keep each end to its matching color as much as possible). But if you're doing something with a lot of color changes, you're going to have a lot of ends, which can be a real drag to weave in individually. With a copious amount of ends, it's easier (and still secure!) to simply braid them. But first, you need to prep your piece. First, decide which end you want to start braiding at. It will be less bulky at the start than at the end of the braid. For a sleeve, I recommend starting at the wrist and ending at the armsceye. At a minimum, you'll want to pin down your garment at the top. You may also wish to pin out the sides so your braiding doesn't distort your fabric. Separate the yarn ends at the top of the piece into three roughly even parts and begin braiding, adding new ends to the back of the thirds as you come upon them. [This braiding technique is exactly the same as Dutch/Reverse/Inside Out French Braid if you need further help, and is, incidentally, the only kind of French Braid I know how to do.]. When you get to the end of your garment, keep braiding for at least another inch and tuck the braided "tail" into the braid. 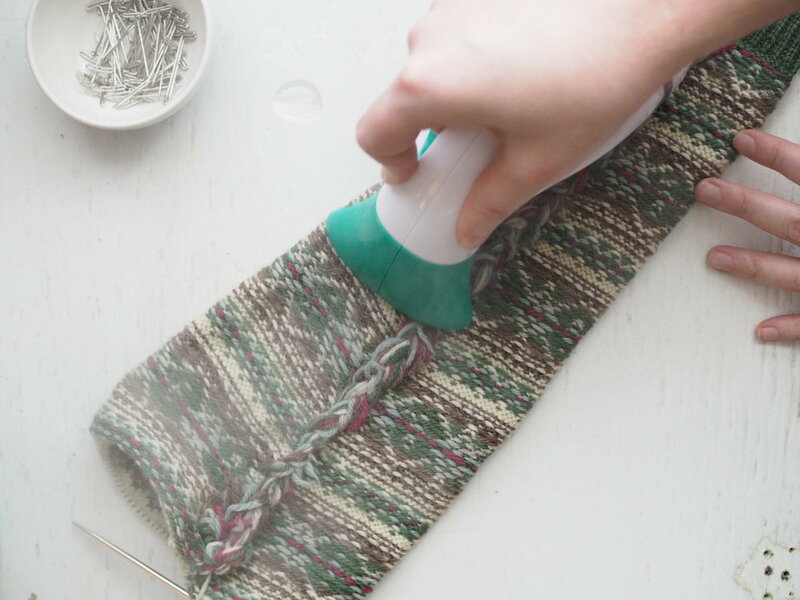 Lastly, give the braid a block with a steamer (or iron and pressing cloth) to flatten. Over time it will start to felt together and become even more secure (assuming you're not using a superwash yarn). To choose sufficiently contrasting colors, remember that a yarn's value and saturation is more important than hue! Swatch it! Just do it. Really. Consider ways to extend your floats and keep your knitting stretchy, including needle changes and working inside out. Got a ton of ends? Braid them!! For additional colorwork tutorials (like steeks), check out some of my favorite resources at Tin Can Knits, Paper Tiger and Kate Davies. These designs keep it to two colors, but have larger motifs/longer floats to manage. Ready to tackle something big?